I stopped into The Children’s Place today at Colonie Center and found two large racks of fleece two-piece pajamas (one for boys and one for girls) marked down to $2.99. 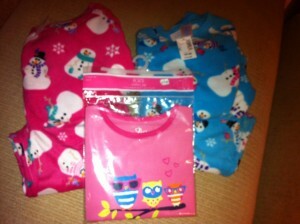 Pajamas were size 5 and up with a few packages of cotton pjs for the same price in smaller sizes. I picked up the following (originally $16.95 each!) AND they offered a 25% off coupon so each pair was only $2.24! The coupon deal ended today but click HERE for 20% off printable coupons.